It is when the mind is quiet and the body still that the real truth may be revealed. In this space we are primed to receive messages with regards to our purpose and how to proceed in manifesting our fullest potential. Our minds our like a turbulent body of water, only in the stillness can one’s reflection be seen. Time of day: Choose a time when you are most relaxed, before bed or when you first wake. Comfortable Clothing: Select some comfortable inviting clothes that you feel cozy and warm within. Pick something appropriate for the room temperature. People often feel most comfortable when shoulders and neck are covered. Comfortable Posture: Assume a comfortable seated position on the floor with pillows or in a chair. Be sure that your back is straight. Provide yourself with additional back/neck support as needed with elevated cushions, pillows or props to ensure maximum comfort. Choose whatever hand position or mudra feels the most comfortable. Quiet: Choose a private place where you will not be disturbed by activity, people or technology. Turn off phones and computers as well as minimize other potentially distracting noises. If needed, use ear plugs to shut out the world and help you concentrate on your breath. No Stimulants: It is challenging enough to quiet the mind and still the body. Before meditation, avoid coffee, sugar, caffeinated teas, chocolate and anything else you know that stimulates you. Sacred Space: Create a regular sacred space or altar and surround it with peaceful images or items. Amethyst crystal is known to relax the body and assist in opening consciousness. A peaceful meditating Buddha statue may be an inviting image. You may also enjoy candlelight. This is all optional and very personal. Smells: The sacred temples in India are filled with the aroma of Nag Champa incense. Other popular calming scents are Temple Incense and Sandalwood. Some essential oils assist in relaxation and others open conscious channels. Sacred Sounds: You might enjoy soft tranquil music or water sounds as long as the sound helps you relax and does not distract your breathing and focus. 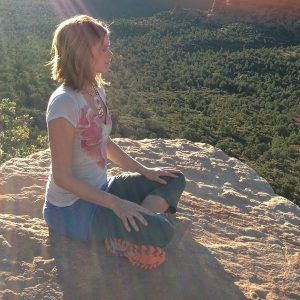 Guided Meditations: Initially, you may find it helpful to utilize some prerecorded guided meditations to help you connect with the breathing, focus your mind and assist with relaxation. However, nothing will take the place of sitting in your own silence, practicing your breathing, learning to self-calm and focus your mind. 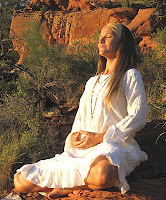 Breathing: Breathing is an integral aspect of mediation. With every breath, breathe with the conscious intention that you are drawing from the “clear, white light,” synonymous with God or love. As you regularly practice meditating, you will learn that the key to getting the most out of this mental exercise is to BREATHE. Continuous, deep breathing not only calms the mind, it also strengthens the mind. You may also explore breathing in the word “Let” and exhale “Go”. Clearing the Mind: The yogis often utilized a mind-clearing “Breath of Fire” called Kapalabhati. This breathing technique acts to oxygenate the brain, clearing toxic substances and thoughts in the process. This is a deep diaphragmatic, not Chest Breathing exercise done with the mouth closed. The exhale is short, rapid, and strong. We use the lungs as a pump, which rapidly expels the air from the lungs up through the nostrils. Seated with your eyes closed, try this exercise for 33 rapid exhales, take a deep inhale and suspend the breath for a few moments and let your brain be oxygenated and mind cleared, then exhale slowly. Repeat this one or two more times and move right into your meditation. Focal Point: When you are deepening into your stillness, gently focus your internal attention on your “Third Eye” space, the point between your eye brows and back a couple of inches. This is a gateway to perception, stillness and inner peace. 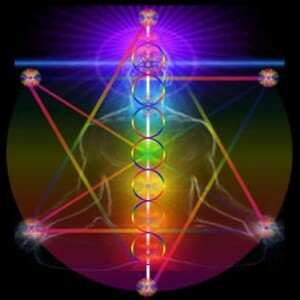 It connects energetically to the Pineal gland which among other roles is responsible for illumination and higher consciousness. Extended focus on this area massages the pituitary gland and releases “bliss” chemicals into the brain. The yogis discovered that this greatly enhanced their inner peace and joy during meditation. Still Point: When you are sufficiently relaxed, your mind is calm and peace is all that remains, this is called the “Still Point.” This will last for brief periods of time then the busy mind will interrupt. Over time you will be able to reach this still point quickly. Other days will be more challenging. Soften the effort and just set the intention you find as much time collectively in the Still Point as possible even if that is only 10 or 30 seconds at a time or repeated 10 or 20 times. As you deepen your practice, you will find that you can find and remain in the still point for much longer periods of time. Re-centering: Your busy mind will usher you out of the quiet Still Point repeatedly. Stay relaxed. Don’t get irritated with yourself. This does not mean you are a BAD MEDITATOR. You are learning to focus your mind. Just gently release the mind’s activities (errands, concerns, thoughts) and diligently come back to the breath and the focal point between your eye brows. Just let the thoughts float by like clouds without engaging them. The thoughts will be there later after meditation to tend to. The thoughts can wait while you re-choose stillness and calm for a brief period of your day. Affirmations: There will come a time near the close of your meditation to set clear intentions and anchor positive affirmations. This is a powerful place to manifest within. The universe will feel your clear, high frequency loving vibrations. With your highest resonant frequency, see your fullest potential unfolding. Be in the deep heart-space with this process. Feel it happening. Ask for what you need. Offer what you have to give. Let Spirit speak to you. Just listen. Closing: Take a few final moments to give thanks in your own way to whatever or whomever you are grateful for. This is a beautiful time to send blessings to loved ones, situations/people in need of love, support or healing.